ASUS, a brand that a few years ago people wouldn't have associated with audio. And then ASUS decided that Creative was mistreating computer users' ears with their X-Fi and launched the Xonar series of cards. So started the 'X-Fi for gaming, Xonar for music' saying. I confess, at first I thought it was just some marketing nonsense and users' self-satisfaction. 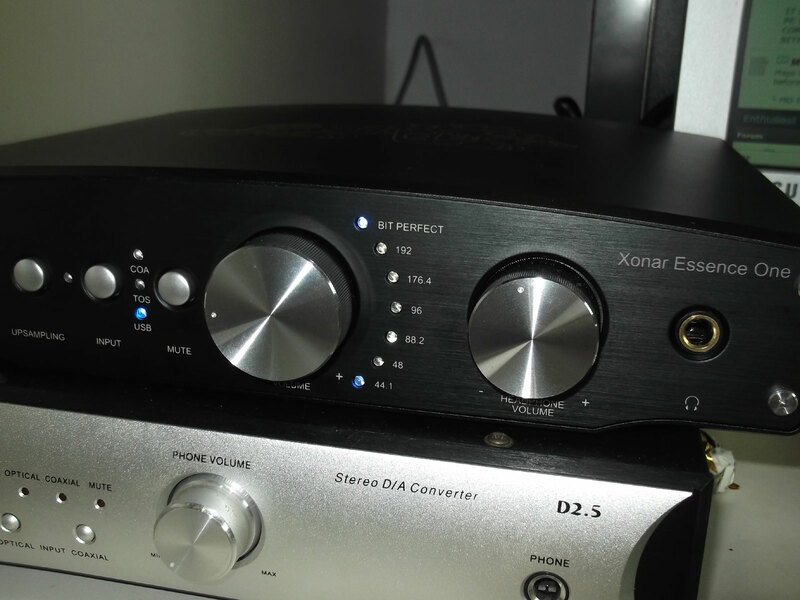 But after getting the Xonar DX, I realized that this series of cards is a very cheap way to enter audiophilia. I haven't heard the STX, but if it is worth its price over the DX, it should be very good. It measures very well too. How well? 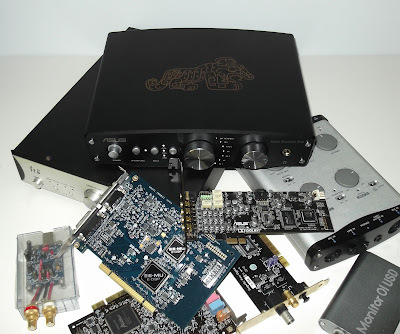 Put it this way - most audiophile/"audiophile" DACs don't go near the STX in measurements. In fact most of those have problem matching DX. But still, despite good sound and awesome measurements, when people have SGD$700 to spend, they don't want to buy a ~SGD$250 sound card, which some (or is it many) also believe to be inferior to external DACs for whatever reasons, like computers being noisy (despite SNR measurements proving otherwise). But at the same time, they don't know what to buy. Ask the internet and you get "satisfied users" recommending some new product from China that nobody really knows anything about and gets discontinued after a year or two. Below $300 there are many choices including big-time brand names, at about a thousand there are DACs meant for pro-audio, but between this two price points, products that one can trust are few and far in between. So when the Xonar Essence One was announced, I was excited. STX already measures so well, how much better can they do with an external DAC. Being an external DAC, it also satisfies sound card haters. And it also provides a solid choice for people with $700 to spend, considering ASUS's previous products. And when I was offered a unit for a trial, I was very excited. Normally I like to start with a measurement. But not this time. Because, this is a Xonar. My measuring card is a Xonar, the cheapest one. This Xonar Essence One is the most expensive Xonar. Poorer performer cannot be used to measure better performer. Other reviews of the Xonars mentioned the report, but none mentioned its importance and significance, and I'm going to talk about it. First, the publishing of such measurements is not a common practice in audio or even most consumer products. A lot of the time the numbers on the product specs are taken directly from the datasheets of the components that the products use, or simply out of posteriors of marketing departments. 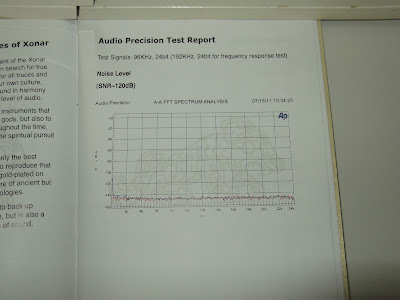 Even for pro-audio and component (as in just the single chip itself for example) manufacturers who need to publish real (or, more accurate) specs because their products' performances can be easily verified, detailed specs such as the results on the spectrum analyzer are optional. Because not saying is not lying. Second, in order to accurately measure an equipment's performance, the measuring equipment has to be better than the device under test (I'll call it DUT here). For example, the DUT has a noise level of -90dB. 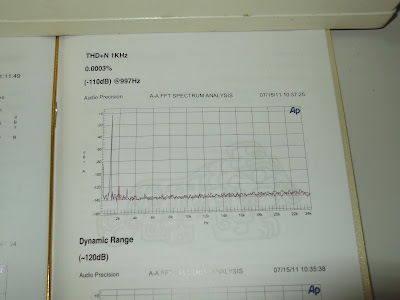 The measuring equipment has a noise level of -80dB. The measuring equipment will measure -80dB even though the DUT performs better than that. For poorer-performing audio gear, a cheap sound card is enough. 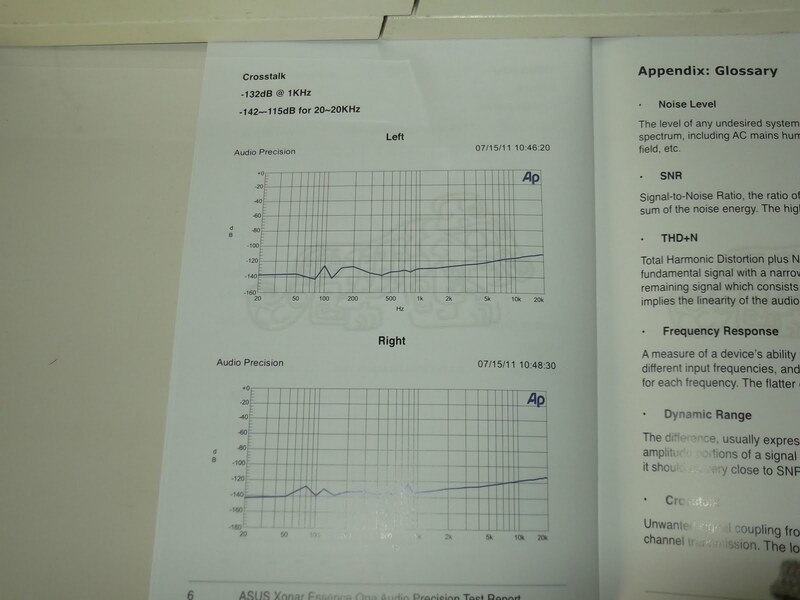 But a high-performing equipment needs to be measured with an audio analyzer, an equipment that is designed to test other devices, so that the measuring device does not bottleneck the DUT's performance. That is what Audio Precision is, or to be precise, SYS-2722 from Audio Precision. It really measures your equipment. So when a manufacturer dares to publish the product's AP test report, he is very confident of the product's measured performance. Which is a rare and exceptional thing in audiophilia, where poor-measuring products are a dime-a-dozen. Update (13/10/11) - After reading some measurements from here, my doubts were partly confirmed. The measurements of the One from the link above are not good at all, but one particular observation that coincided with what I had, was the hum at 100Hz. Essence One has visible 100Hz and its 2nd, 3rd, 4th and higher harmonics (200Hz, 300Hz, 400Hz etc.) at rather high amplitudes. 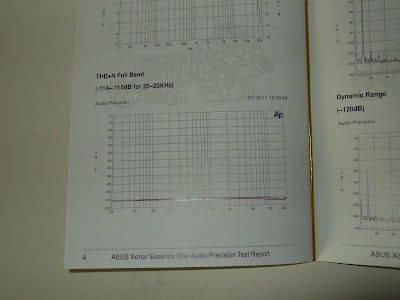 Hence I was suspicious at the noise level graph of the AP test report below. 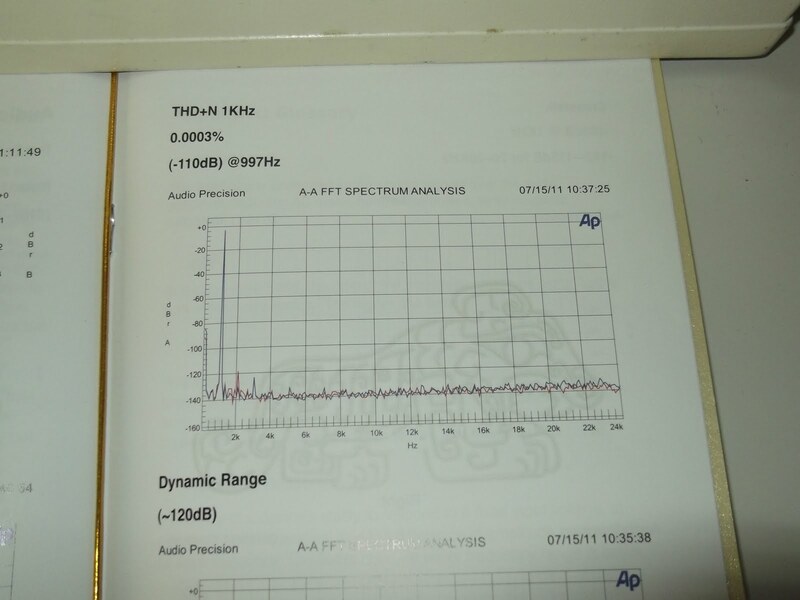 However at the same time I couldn't really trust my Xonar DX, being a sound card in a computer I am not sure how the ground is generated and connected and how that has an effect on measurements, especially power-related ones like this 100Hz is. Actually, the rest of the noise level measurement that I got was also similar to the one in the above link. Even if the output is hypothetically distortion-free, add that wierd-looking noise floor and you get a nasty-looking THD graph. I'm not sure if I measured additional 2kHz though (I think I did, but I'm not sure). If one person has unexpected results, it is better to not jump to conclusions, so I treated my measurements as an anomaly and did not post them in case people do not read the fine print (which always happens). But if two people have similarly unexpected results, then the device-under-test and/or the commonalities in test methodology is more likely to be the cause. But at the same time, ASUS's AP measurements for the STX are not that far off from what others have measured. So I do not believe ASUS is publishing fake results. If this is the case, then what could have caused such a big discrepancy? Would the balanced out yield the much better results? Well, I can't do anymore measurements for the unit is not with me anymore, so it's up to others to solve this mystery. I don't know if the sharp rise at the left is due to genuine hum or poor FFT resolution at lower frequencies. Then again, is the problem of reduced FFT resolution at lower frequencies supposed to show up on a linear scale? Why did they use a linear scale anyway? But what escapes the eye can't escape from Audio Precision, which still gave it an excellent -120dB score. Interestingly, in this AP test report of STX below, the STX has a better score but seemingly worse lower frequencies. Weird. Kinda strange that the external DAC measured worse than an internal sound card in noise. But I'm more interested in something that is usually at least 10dB worse than noise. THD. THD, is, beautiful. -110dB maximum across all frequencies. How much is that? Yup, 0.0003%. It's written there. No that's not what I mean. How about lets take a look at a reviewer's measurement of the Benchmark DAC1 with the same SYS-2722. Yup, that Benchmark DAC1. SGD$1600. So... the Essence One beats that Benchmark DAC1 in measured performance. That Benchmark DAC1 that is well-known for measured performance at SGD$1600. But, there is another product that also beats the DAC1. And it is even cheaper than the Essence One. And it is also from ASUS. Yea, it's the STX, you probably guessed that by the previous sentence. The STX measures just sliiiiightly better. But here is where I noticed a problem. 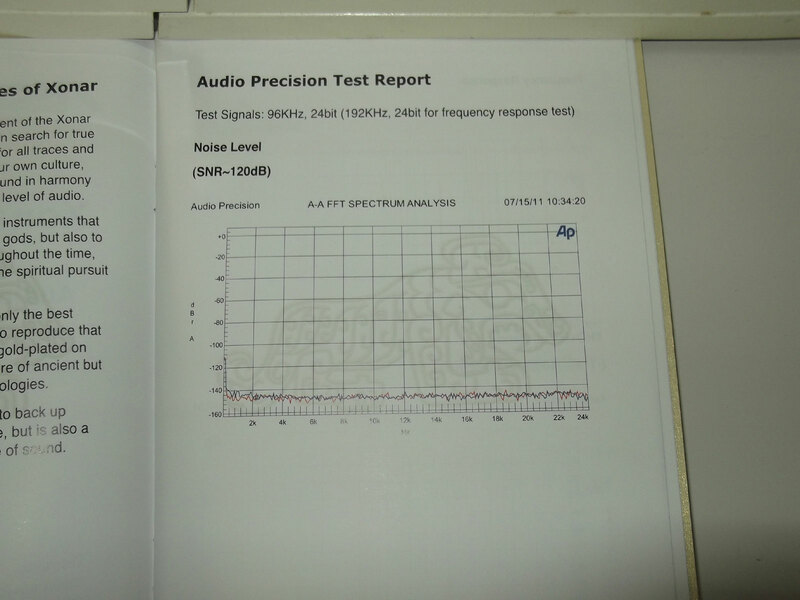 Audio Precision SYS-2722's rated performance is 0.0003% THD. So both products are already at the limit of the measuring equipment. The performance of high-precision measuring equipment can change or degrade with time, I don't know if that is the case here. The SYS-2722 is still within specs though, but measurements below the rated limit needs to be consumed with vinegar. ASUS measured the Essence One years after they measured the STX, maybe the SYS-2722 has degraded by a few dBs, or maybe simply a different SYS-2722 was used? This also explains the slightly worse noise performance of Essence One vs STX. The SYS-2722 is rated at -120dB. Anyway, just for hitting the limit of SYS-2722, both products are wow. But this way I can't compare the difference between the two. Or can I...? It has second harmonic at -120dB, third harmonic at even lower, and higher harmonics at non-existent. Measured noise for for STX is 4dB better than One, but measured THD+Noise @ 1kHz is the same, therefore the THD portion of the One would be better. Lower distortions is more important, since they are always audible above the noise floor. BTW -120dB is the limit of human hearing. In the sense that the smallest sound that can be heard is taken to be 2×10−5 Pa, or 0dB. So if you want to hear something that is -120dB as loud as the main signal, the main signal has to be 120dB, which is the safety limit for hearing damage. Crosstalk, just to complete the set of measurements. For an Audio Precision measurement, this is missing a lot of things that the AP is capable of measuring - square wave, linearity, or at least give us IMD which even RMAA has? Oh well, already takes a lot of guts to provide the THD measurement, can't really complain. Verdict on measurements: If those figures are true, ASUS has created a monster. If anybody knows anything that performs better at the Essence One's price range, or heck at any price range, please sound out, because I am really interested to know. On quick glance this thing doesn't look much different from most DACs, apart from the XLR out which isn't very rare either. But it was when I started using it I repeatedly got impressed. The built-in USB - unlike most other USB DACs that are limited to 96kHz, the CM6631 used in the Essence One is a USB 2.0 part that supports 192kHz. Needs to install driver though, but which good hardware doesn't? The lights beside the line-out volume knob displays which sampling rate the DAC is receiving. 44.1, 48, 88.2, 96, 176.4, 192, and... bit perfect...? Time to check the manual. Turns out, the bit perfect lights up when the USB is used via ASIO drivers. Wait... this USB has ASIO...? Lets check in foobar2000. Yupz... it has ASIO. Would make more sense to label it ASIO, but I guess the target market is more engrossed over bit perfect than ASIO. Two independent digital volume controls. Extravagant like a king. Great for people who use both speakers and headphones. Quick testing shows that the volume controls don't induce measurable distortion, at least when measured with my Xonar DX. When the unit is turned on, the selected source is always USB. I guess most buyers of ASUS products are computer users, and most of them use USB. Speaking of USB, in this review by Sound News, the USB was not working well. I used the latest drivers downloaded from ASUS's website, sometimes there is noise, most of the time not. In fact I think whether the noise is there or not is decided when the unit is turned on, and once it has the noise (or not), it stays that way until the unit is turned off. I can't pinpoint the cause, because out of the many times I cycled the unit's power, only 2 or 3 times the noise was there. I leave my equipment on 24/7, so this is not an issue once I manage to make it start with no noise. The output impedance of the headphone amplifier isn't what I consider to be negligible. Quick testing shows a drop in output levels of about ~1dB (varies with volume control position for some reason) with a 33 ohm load, which gives an output impedance of around 4 ohm @ 1kHz. I did not check if it is frequency-dependent, and it was a very rough check, a single-digit ohm should be a fair guess. Someone else would have to verify this, but until then I'm not too impressed with the headphone amp. Some equipment have a resister, for example 47 ohm, in series with the output. This is done either due to performance issues and/or to control the power into the headphones when switching between headphones of different impedances. Also the 1996 IEC 61938 standard specifies a 120 ohm output impedance for headphone amplifiers, though this standard hasn't been care about much lately. Hence there are differing views on whether a certain value of output impedance is bad. Some believe such a value is good enough, citing equipment with much higher values, others claim to require as close to zero as possible. (I belong to the latter.) But I'll leave the number there and let you decide. That's why numbers are good - they don't have their own opinion. There is an upsampling button which I don't really know does what apart from upsampling (but what kind of upsampling? ), but it introduces a rather steep low-pass filter which also starts rather early. I don't have the graph or exact numbers, but the difference *might* be noticeable. Trivia: At 14-15W power consumption, the sealed top of the unit gets fairly warm. I simply can't stress this enough - the human ear-brain hearing system is unreliable and can hear things there are not there. Blind testing is essential to eliminate placebo, and multiple trials are needed to ensure what is heard or "heard" did not occur by chance. In this review, multiple-trial blind testing was not carried out. So it is possible that my observations are incorrect. This should be kept in mind when reading such reviews. If I were to pick something to compare the Essence One against, it should be something that many people are familiar with. And something that is good of course. So I picked Xonar DX. Which is also my choice of source among the pile up there (minus the Essence One which I do not own). First impression of the Essence One, is that it has a sound signature that is largely similar to DX. Could be because they are both Xonars, could be because of placebo effect because I know that they are both Xonars, could be because I have gotten more conservative instead of making wild claims. But it was not long before I appreciated the spacious and less-congested treble, which is what I have always felt the DX lacks. The bass goes deep, but controlled, I could feel the initial shockwave from when the beater hits the membrane. Bass guitars were definitely enjoying the bass performance, being reproduced with greater accuracy. One would be able to hear more clearly the settings of the preamp. Usually when I compare two pieces of audio gear, one of them would sound different from the other, but which one sounds better would be up to personal preference. Not this time. 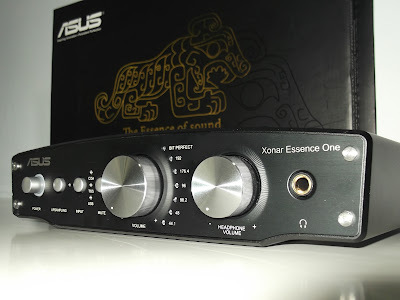 The Essence One sounds like a DX with its bass and treble weaknesses removed, an all-rounded improvement which I could find nothing to complain of, and upgraders from other Xonar products need not worry. That was comparison against Xonar DX. As for how Xonar DX compares against others in general, the DX has a less pronounced though much cleaner extreme highs (compared against others with more distortions at high frequencies I guess), a powerful bass that may be uncontrolled at times, and an overall sound that feels like a recording studio, not as fun and lively as the rest, boring but somehow "sounds right" (I don't dare to use the word "accurate"). The Essence One keeps the humble and clean treble, and adds the life back, with improved bass, while still sounding like a Xonar. The price of $699 may seem steep compared to the STX, but the chassis, power supply and control circuitry of an external product easily costs a good fraction of a complete product. Add the SPDIF inputs and digital volume controls, and the Essence One isn't really that expensive compared to the STX, and for the extra money you get a pair of expensive PCM1795 and some form of upsampling, courtesy of the DSP. And lets not forget the Essence One only seems expensive compared to the STX because the STX is super-cheap compared to everything else. It is hard to give a verdict on something that does not have an alternative for its price. It is very easy to give a verdict when its alternatives are a few times more expensive. The measurements already justify the price, and if you are a believer of measurements and/or ASUS, wants an external DAC and has SGD$700, what are you waiting for. Do consider the STX if you are cash-strapped, but in audio it costs a lot more just for that extra bit of performance, and especially if that performance is the best. Still waiting for a good headphone amp for my Shure SE-535s, this seems to be the ticket. Does anyone have any clue when it'll be available? A better and cheaper dac from ASUS is XONAR ESSENCE ST PCI. Please do not confuse it with STX. I see what ASUS did there. Listening at very low volume levels, the potentiometer does not keep the volumes of each channel the same. The bottom 2 notches on the volume control (for both headphone and speaker) will have the audio come out significantly stronger on one channel than the other. On the quietest notch, one of the channels is essentially muted and I get to listen to mono. Interestingly enough, the channel that gets quiet is reversed between the speakers and the headphones. Have you met with this problem during testing of Your's Asus ONE? I didn't use it with the volume control at the bottom two notches. The low volume issue is a big indicator that the Essence One is using a cheap quality potentiometer for the volume control. There's not much you can do but get a replacement and hope that it is better. You could replace it with a much higher quality potentiometer or stepped attenuator if you are adventurous. @ Above post: As I mentioned in the review, the One uses digital volume controls, not the mechanical pot/stepped attenuator that you're thinking. The front panel of the Essence One has 2 volume controls, mechanical ones. They are controlled via a potentiometer if you look at the internals (a 10k ohm potentiometer judging by the "B10k" writing). Unbalanced volume levels at lower volume adjustments is a characteristic of an unmached pair of potentiometers. The Essence One appears to use a cheap quality dual-ganged potentiometer package that isn't matched properly (again judging by the internals). "Volume controller: Balanced Output: Quad Units Taper B Potentiometer; Headphone Output: Quad Units Taper B Potentiometer"
I have worked with many low end amps that use cheap potentiometers and this is always the cause of the volume inbalance between the 2 stereo channels when adjusting at lower volume levels. I have also designed digital volume controls and they NEVER have this inbalance. The problem with them is that you pretty much throw away data bits when you lower the volume. As a result, at low volume levels, you have a low quality stream of audio (you won't really notice anyway since volume level is low). To compensate, you need at least a 24bit audio stream (32bits+ internally during the DSP stage for "audiophile" quality). Normal CD quality is only 16bits thus why pots or stepped attenuators are prefered (they also provide for a nice and cheap turning knob design).